Aug 9 She is Potty Trained!!! Exciting news! 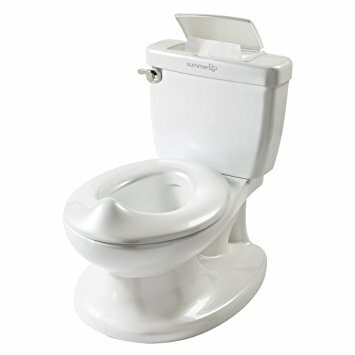 My almost-three-year-old is finally potty trained! Disclaimers: 1. I am not an expert. 2. I have linked some products that have helped in our potty-training journey. The links in this post contain affiliate links and I will receive a small commission if you make a purchase after clicking on my link. I made many mistakes, I bought an abundance of pull-ups and cute tiny undies, and I waited. And waited. And wondered if I would ever be able to send her to preschool. And then, all on her own, it just clicked one day. Moms who have gone before me on the dreaded potty-training journey told me it would happen, but I was skeptical. And then one day, it happened. How? I don’t think I can pinpoint exactly where I went wrong with potty training. We’ve been using pull-ups since before Annabella turned 2 because she hated having her diaper changed. At that point I don’t think she was ready to use the potty, but I wasn’t in a hurry to start either. Pull-ups helped us get through that time by giving her something to feel “big.” She could put them on by herself or with little help from mom and dad. Unfortunately, the newness wore off and they just became diapers to us. Before this time, she had shown some signs of readiness, but I didn’t know how to translate those signs to her actually using the potty. We had a lady bug potty from my sister, but it became a toy to Annabella. The big potty also became a game as well. She would tell me she had to go potty, I would run her into the restroom, put her on the toilet, and she would immediately jump down and say she was done. This frustrated me so much. I didn’t try to hide my frustration at all, which was a big mistake. Since pull-ups lost their novelty, I tried to just put Annabella in underwear so that she would realize if she peed in them, she would be uncomfortable. Well. For a while she didn’t care if she was wearing wet clothes or if she had just peed on the carpet or couch. Again, I became visibly frustrated, which led to our next problem. Annabella would ask to wear underwear, but she would absolutely refuse to use the potty. She would hold it in for hours until she physically could not hold it anymore. Then she would cry because she didn’t want to use the potty, and I think she was afraid that I would be upset with her. While I wasn’t upset with her, I would make her put on a pull up. I was afraid that if she continued to hold it in, she would get a UTI or experience worse problems. After the last incident, Jeremy and I decided not to push potty training on her. We decided to take the pressure off and wait until she was absolutely, without a doubt, ready to use the potty. We didn’t ask Annabella to use it – we left it in the bathroom for a few weeks. She would sit on it while I was getting ready in the mornings and turn the handle to hear the flushing sound. I would talk to her about the potty and encourage to sit on it (while fully clothed) but I did not force her to use it. Then, she got her new “big girl” bed. I honestly think this helped her more than anything else. Giving up her crib/toddler bed helped her realize that she is getting bigger and able to do things that she couldn’t do before. About a week after she got her new bed, we were going to the splash pad after my small group meeting at church. I had to change her into her swimsuit at the church, so I needed her to use the potty before we left so we wouldn’t have to use a swim diaper or have a soggy car seat. I told her for two days that she would have to pee in the potty on Thursday before we could go to the splash pad. She did it! I was so proud of her, and she knew it too. The next day, Friday, I woke her up and started getting her dressed to go to my mom’s house to do laundry. She asked to wear underwear instead of a pull-up. I said okay, but that she had to use the potty. I made the decision in my heart not to get frustrated or upset with her if she did not use the toilet. I told her she needed to use the potty right when we got to my mom’s house, and she agreed. Of course, when we arrived she refused to even try. I took a deep breath and let her go play with her cousins, but I kept giving her lots of water and asking her if she had to go. She held it for quite a while, so I asked her if she wanted a pull-up. She did not. I asked her again to use the potty, and yes, I bribed her a little. This time she tried. And she went! That first day was a bit rough but she did it! She had two accidents later that day, but when we got home she finally christened her little potty! Ever since that day, she has been using the potty every day with almost zero accidents. 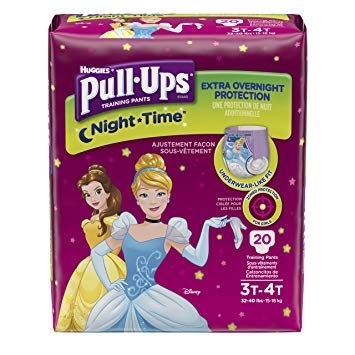 We still use pull-ups at night time, because 1. Brand new bed and 2. We’re trying to have as little pressure as possible. But her body is learning! One night she woke up during the night because she was scared, and while I was up with her she told me she had to use the potty. She laughed when she realized she was wearing a pull-up, but she used the potty anyway! I am so proud of Annabella. She is so proud of herself too. I love watching her face light up when she goes potty, especially in a new place. I was dreading potty training for so long, but now I am so happy that we have finally reached this milestone.